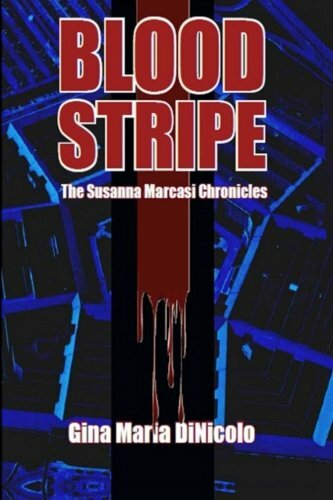 “Blood Stripe: The Susanna Marcasi Chronicles” by Gina Maria DiNicolo is a high-speed psychological military thriller so powerful, I don’t think my blood pressure went down until I finished the book. The prologue sets the pace for the entire novel at Quantico Basic School. Susanna Marcasi is unstoppable, topping the class in academics, setting the pace in the field, in fact, besting her male counterparts in every possible way. Heading back to her room one evening, Susanna is the victim of a vicious sexual assault and left for dead in an abandoned men’s restroom. Captain Deke Bigelow knows exactly what happened and who was behind the sadistic attack, but finds his hands tied as he receives a decree from the Commandant of the Marine Corps to bury the incident. Years later Susanna still suffers with mental and physical disabilities as the result of her accident, an incident in which she has no recollection, but is sure there is more to what happened than is on record. Susanna receives a call from Louisiana Senator Lori O’Reilly one night to get to the truth about the apparent suicide of Lori’s lover, Lt. Col. Joe Earhardt. Events rising far beyond New Orleans and Washington unfold as Susanna finds herself going up against Manfred Stahl, the powerful and vindictive defense secretary. Her investigations also enrage a powerful man from her past, and the two seem destined to head down the same deadly road they encountered together a lifetime ago. There is so much going on in the plot of “Blood Stripe.” It is jam-packed, full of action and suspense with so many twists and turns, many of them I would never have imagined. Deception, high-level government corruption, danger, and intrigue mark page after page. The author clearly knows her stuff as a former marine, military historian, and award-winning journalist. The story is extremely well written, the characters are highly developed and frighteningly realistic. One might wonder, in fact, whether or not they are real, indeed. Fans of military and government thrillers, full of suspense, drama and intrigue will thoroughly relish “Blood Stripe: The Susanna Marcasi Chronicles” by Gina Maria DiNicolo. Without a doubt, this novel sets the stage for more engrossing operations, and I look forward to seeing what Susanna Marcasi has in store for us next.